By simply upgrading your fence’s post caps you give your fence a whole new life. 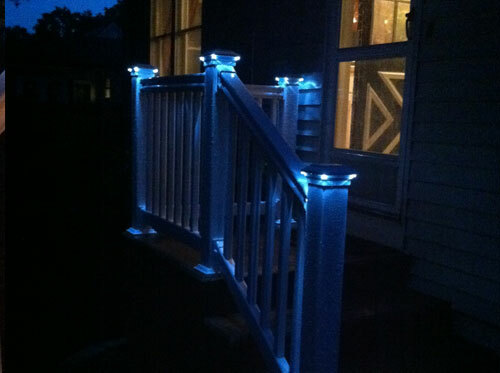 Enjoy your fence after dark with low voltage or solar post caps. For those that want to dress up their fence without lighting, decorative post caps are available in a variety of woods, copper, stainless steel, Tiffany glass, and many more. There are dozens of options for every style of fence and every size fence post. 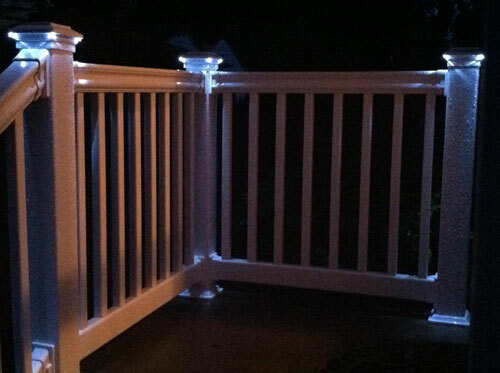 The railing featured above is a 3000 series with Model balusters and plain Newel 4×4 posts in white. Includes white Saturn flat solar caps. Balusters measure 1.3 inches square. Both top and bottom rails are reinforced with aluminum channels. The top rail measures 3” wide x 3.25” high and bottom rail measures 1.75”w x 3.5”h.